Now I understand the cheesemaker. A person who has decided to devote their life to curdling milk and playing with it until it tastes completely different and utterly delicious. Goat's milk, lemon juice, and salt. You can't go wrong: just heat, mix, and hang to strain. A tip from my boss, who happens to be one of American's best cheesemakers, is to let it hang at least two hours. A particularly succesful batch for me was the one I forgot about for seven hours. Squeeze to dry. Now, my boss also happens to have a brand new cookbook out, and along with her I am giving away a free signed copy of her book to one lucky winner. 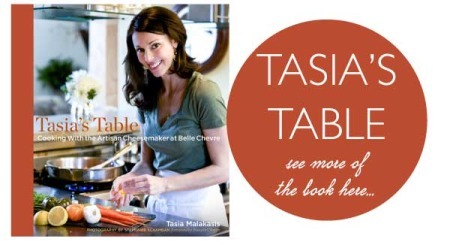 Simply leave a comment below and, for an extra entry, tweet this contest using the handle @martibk, @BelleChevre AND the hashtag #tasiastable. 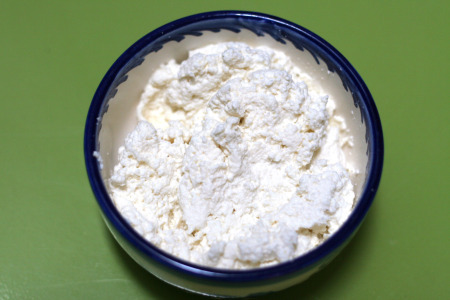 In a heavy-bottomed pot, bring goat milk to a boil over medium heat. Take off the heat. 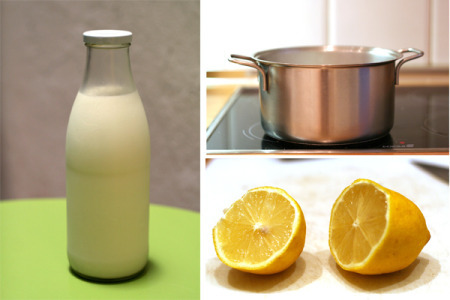 Immediately stir the lemon juice into the milk. Let stand for a couple of minutes, so the milk can curdle. Lay out a cheesecloth (or a cotton kitchen towel) in a bowl. Pour in the milk-lemon mixture. The curds simply resemble curdled milk at this point so don’t worry that they will pour right through the cheesecloth— it will catch them. Tie the ends of the cloth together so it becomes a bag. Hang it on a wooden spoon and let the bag hang free. The whey should strain out of the cheesecloth for at least two hours. Before taking the cheese out of the cloth, squeeze the cloth to extract more liquid from the cheese. Transfer the cheese from the cloth to a bowl and season it with salt. Here's a list of participating bloggers, all lovely, talented ladies!